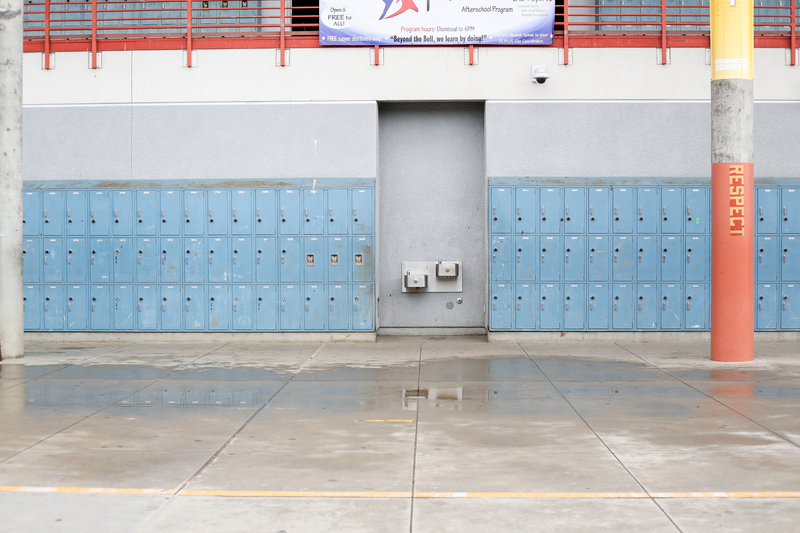 Classrooms at Vista Middle School sit empty on the second day of the Los Angeles teacher strike. Updated Thursday, Jan. 17, at 8:07 a.m. ET. Students in Los Angeles have a new routine this week: When they arrive at schools in the morning, they're greeted by teachers — in picket lines. Teachers began a strike on Monday after their union and the district failed to negotiate a new contract. Schools are open during the strikes, staffed by administrators, volunteers and newly hired substitutes. Still, the school day is anything but typical. On Tuesday morning at Vista Middle School, Assistant Principal Sharlene Martinez taught a language arts lesson to about 150 seventh graders in the school auditorium. Students sat in rows, following along on their laptops. When it was time to switch to math, Martinez passed out a worksheet with a series of shapes on it. "My credential is in English," she said,"but covering the math? My gosh, it's very challenging." She was eager for this teacher strike to end. "I mean, I'm hardly getting any time to sit, eat, breathe, go to the bathroom." Still, the first two days were pretty smooth, she said, in part because she was expecting to have a lot more kids come to school. But only about 50 percent of Vista students showed up on Tuesday, according to Principal Joe Nardulli. The library was closed, and entire corridors were locked up. Nardulli showed off the area where the eighth graders learn: Classrooms were empty, with chairs facedown on top of desks, and the hallways were quiet. Only about 50 percent of the Vista Middle School students showed up for class on Tuesday, says Principal Joe Nardulli. On a normal day, Nardulli said, "This would be a full place. There would be about 410 students roaming the hallways." Attendance has been low at elementary, middle and high schools in the LA Unified School District. On Monday, only about a third of the district's students came to school, according to the district. (That number does not include charter school students, who aren't affected). More students were in school Tuesday, but that number fell again on Wednesday. That's a problem because district funding from the state is linked to attendance. Each day of the strike means an estimated net loss of about $10 to $15 million dollars, according to the district. Negotiations between the district and United Teachers Los Angeles started in early 2017, and union members have been working without a contract for more than a year. UTLA has more than 30,000 members, including teachers, librarians, school nurses and counselors. They're striking for smaller class sizes, more counselors and librarians, and a full-time nurse in every school. The district says it doesn't have the money to meet those demands. "Be assured that Los Angeles Unified is not going to put our students in the middle of this dispute between adults. While state law does not excuse absences in case of a strike and students are expected to attend class, principals will work with students and families on attendance. ... Student absences during strike will not impact graduation." Rosa Escobar is very concerned about attendance for her daughter, Kimberly, during the teacher strike. It's unclear how families will take that message. When Rosa Escobar heard it, she said she felt a lot better. She was very concerned about attendance for her daughter, Kimberly, a fifth-grader at Alta Loma Elementary. "So I won't get in trouble if I'm not there?" Kimberly asked her mom Tuesday night. "No, no," her mom assured her, "but you'll still be marked absent." Kimberly did go to school on Monday and Tuesday, though she said she "didn't really learn much." She had a grammar lesson on a school iPad and watched videos, including one about oceans. She said only a few other fifth-graders were in class. Across town at Kingsley Elementary, about half the students were absent on Tuesday. "A lot of parents are holding their kids back — that's their way of joining the strike," said Kenya Tomas, a teacher's assistant there. Many TAs, including Tomas, are in schools during the strike. She supports the teachers, but isn't in their union, and she was told she could lose her job if she doesn't come to work. Kimberly did go to school on Monday and Tuesday, though she says she "didn't really learn much." Tomas said school this week involves a lot of busywork. "We have them doing just worksheets and movies. That's literally it." They've watched Cloudy with a Chance of Meatballs and The Boss Baby, and she was thinking of showing students Coco on Wednesday. At Miguel Contreras Learning Complex, a campus that houses four smaller high schools, students told of more empty classrooms and hallways. The campus' class schedule had time for movies, team-building and crafts, and online programs. There was so little going on that several students decided to go home in the middle of the day. 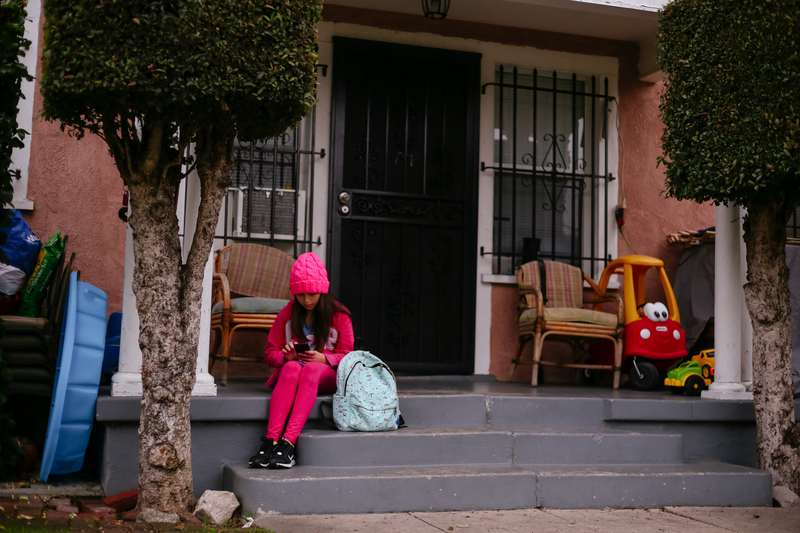 For fifth-grader Kimberly Escobar, the empty halls and irregular schedules had started taking a toll. She was feeling lonely. "I miss my friends," she said, as she started to cry. But eventually, Kimberly decided she would go back to school. "Maybe one day we'll finally tell you everything's back to normal," she said. The mayor's office announced late Wednesday that both sides will meet again on Thursday, and that Mayor Eric Garcetti will "facilitate these negotiations." Outside schools, teachers will continuing to picket on the fourth day of the strike. Students in Los Angeles have a new routine. When they arrive at schools in the morning, they are greeted by their teachers picketing outside. UNIDENTIFIED TEACHER: What do we want? UNIDENTIFIED TEACHER: When do we want it? INSKEEP: They're striking because the teachers union and the district failed to negotiate a new contract. So what is happening inside the schools? NPR's Elissa Nadworny is in LA with the story. 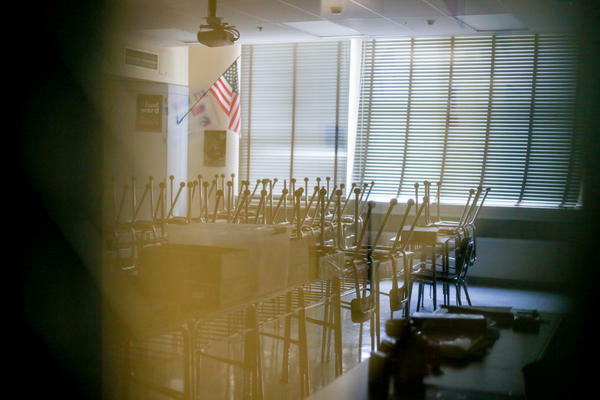 ELISSA NADWORNY, BYLINE: At Vista Middle School, students aren't in the classrooms. They're grouped by grade in the gym and in the auditorium. SHARLENE MARTINEZ: I need all eyes up here, mouths closed. NADWORNY: Sharlene Martinez, a vice principal, is teaching close to 150 seventh-graders. MARTINEZ: OK. We're all transitioning to math. NADWORNY: She passes out a worksheet. It's about shapes and spatial awareness. MARTINEZ: My credential's in English. But covering the math? My gosh - very challenging. NADWORNY: She's eager to have this teachers strike over. MARTINEZ: I mean, I'm hardly getting any time to sit, eat, breathe, go to the bathroom, so yeah. But it's been very smooth. NADWORNY: Only about a half of the student body came to school on Tuesday. Principal Joe Nardulli leads us down what's usually the eighth-grade corridor. Today classrooms are empty, hallways quiet. If there wasn't a strike right now, what would this hallway look like? JOE NARDULLI: Oh, this would be a full place - you know, about 410 students roaming the hallways, passing. And this is the location that students would have instruction. NADWORNY: On the first two days of the strike, about a third of the district's students showed up. And that's a problem because funding from the state is linked to attendance. With those numbers, each day of the strike means an estimated net loss of about $15 million according to district leaders. Across town at Kingsley Elementary, about half the school was absent. KENYA TOMAS: A lot of parents are holding their kids back. That's their way of joining in the strike. NADWORNY: That's Kenya Tomas (ph). She's a teacher's assistant at Kingsley. Many TAs, including Kenya, are in schools during the strike. She supports the teachers but isn't in their union, and she was told she could lose her job if she didn't come to work. In schools this week, she says students are doing lots of busy work. TOMAS: We have them doing just worksheets and movies. That's literally it. NADWORNY: They've watched "Cloudy With A Chance Of Meatballs" and "Boss Baby." KIMBERLY ESCOBAR: We didn't really learn much. 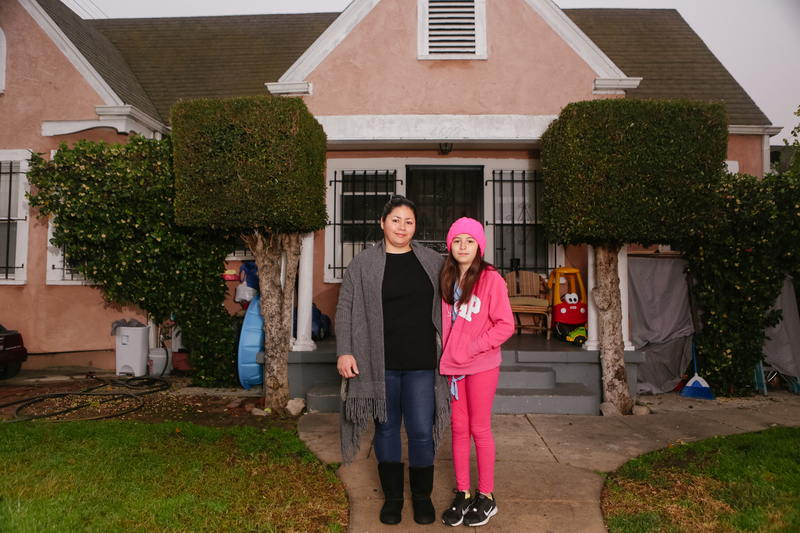 NADWORNY: Kimberly Escobar is a fifth-grader at Alta Loma Elementary School. We've been checking in with her and her mom, Rosa, this week. ROSA ESCOBAR: She's, like, bored. She was expecting something else. NADWORNY: At school this week, she's learned about nouns on a school iPad and watched a bunch of videos, including one about oceans. She wants to stay home tomorrow. Mom has other plans. ROSA: She has to go to school. KIMBERLY: I don't learn anything. KIMBERLY: But there's nothing to learn. We already know about the ocean. It's like we're doing this for no reason. NADWORNY: Few kids were in school on Tuesday. And when Kimberly came home, she was feeling really lonely. ROSA: No friends, no teachers - I know. It's kind of sad. NADWORNY: Kimberly buries her face in her mom's arms. KIMBERLY: I miss my friends. ROSA: It's OK. Chica, it's OK. Hopefully, it ends up soon. It's all right. NADWORNY: By the end of our visit, Kimberly's decided, OK. She'll go to school. KIMBERLY: Maybe one day we'll finally tell you everything's back to normal. NADWORNY: With negotiations at an impasse, it's unclear when that will be. Elissa Nadworny, NPR News, Los Angeles. (SOUNDBITE OF MARCUS D'S "MELANCHOLY HOPEFUL") Transcript provided by NPR, Copyright NPR.